Ben Smith and Ray Roumanous host weekly episodes that delve into taboo topics surrounding the life of athletes, mental well-being, stories of tragedy and triumph throughout their own lives and the lives of their guests. 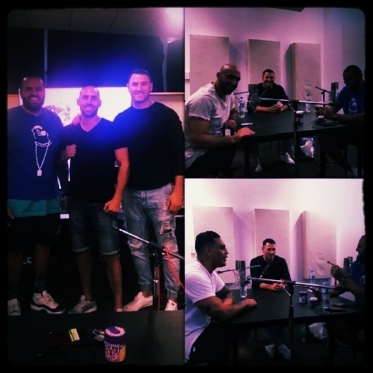 A heartfelt discussion between the two boys regarding a recent and tragic loss in the Rugby League Community lead to the conception of the FullTime Podacst. With so many questions looming about mental health not only in the industry but among their own friends and family, it became fundamental to them to #BlowTheWhistle. The FullTime Podcast is an unscripted, no holds barred look into their own journeys and the journeys of their guests. Topics include battling addiction, the transition into "normality" post retirement for an athlete, weight loss, facing adversity, faith and fear. Ben and Ray want you to know that you are not alone in your struggle. Ben (otherwise known as the Prince of Squince) is a retired Rugby League footballer who played for the Parramatta Eels in the NRL. Ray Roumanous is an established entrepreneur and motivational personality. He is an extremely passionate man who is driven to make a difference. He does also think he is the funniest human alive.